Follow the beam and travel by boat to a Victorian-velvety night. 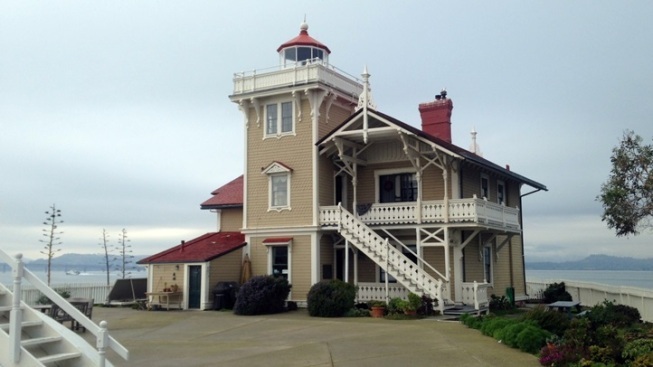 East Brother Light Station, a venerable Victorian located near where San Francisco Bay meets San Pablo Bay, is open to overnight guests. A NOVEL SETTING: You don't need to search too hard to find romantic and windswept settings around California, the kind of picturesque places you might find in a novel. For sure, we have little ocean-charming villages -- hats off, Mendocino -- and winery country abounds, both north and south. We even have a castle or two (high five, Hearst Castle, and you, too, Scotty's Castle). But novel settings don't come more novel than lighthouses, those romantic, beam-beautiful structures that serve an important, and often dramatic, purpose. Staying in one, though, is as likely as spending the night in a castle, but novels always come with a twist: It turns out there is a nearby lighthouse that you can sleep inside, and it is just a ten-minute boat trip off Richmond. A BOAT TO THE LIGHTHOUSE: We speak, of course, of the much-adored East Brother Light Station, the pretty, 142-year-old Victorian structure that's proudly plunked atop a rocky outcropping "in the strait that separates San Francisco and San Pablo Bays." The lighthouse -- er, light station, if you want to be fully accurate, and we'll assume you do -- is open to overnighters, making for an adventurous jaunt out to the wee island quite novel (in both commonly used meanings of the word). It's open to booking Wednesday through Sunday nights, and while you can stay multiple nights, there is one shower, so arrangements should be made with your hosts Bryan and Stephanie ahead of time. INTIMATE STAY: There are five rooms to choose from, four in the light station and one in the building that houses the vintage foghorn, so plan on getting to know, over appetizers and dinner and breakfast, the other occupants of the rooms. You'll in fact make the boat trip over with them, when the sweet innkeepers pick you up at the designated, Richmond-based marina. No need to hang with everyone on the island for the night, but it is a snug situation, with some outdoor areas providing a little alone time, and some mysterious, city-in-the-fog views of San Francisco to the south. Yep, your boat trips to-and-from are included, as are the meals, but there'll be a few things to chew on ahead of time, as with any novel adventure. Can you climb a swimming pool-type ladder from the boat to the island? Are you okay with a muted but definitely-there foghorn calling out to area ships? Do you like doing exceptionally cool things that everyone you tell will want to do, too? THEN YOU'RE GOOD TO GO: The foghorn isn't too much, most guests have said, but earplugs are provided if earplugs are your jam. Comparing it to the older foghorn, which Bryan sounds for everyone on the island the following morning, will make the newer job seem positively understated. As for the history of the light station? Books and photographs are available in the upstairs parlor, which sits below the now-LED beam (which you can visit via two flights of narrow stairs). East Brother Light Station was once in disrepair, but the care, love, and vast volunteer efforts of the nearby community brought it to its present state, a thing of glory. It's worthy of a novel, in fact, even if the night you stay isn't especially windswept (you can still stand upon the island in a velvet cape, looking like a fictional heroine, if you choose, but take care not to overpack). AND WHAT'S THAT OUT IN THE WAVES? That's West Brother, East Brother Island's eternal neighbor, looking for all the world like a frozen-in-place whale emerging from the waters of the bay (and not the rock it essentially is). See if such novel assessments don't start to take over your increasingly romantic outlook while on the island, too. They will.